Utility scissors also used during surgery to cut paper and other materials (such as suture material) that may dull the blade of a sharper instrument. Scissors used for suturing materials or removing stitches are called suture scissors and some of the types called as utility scissors. The scissor is defined as the cutting instruments or materials used in cutting the paper, cloth, hair and other materials with two sharp blades are screwed at the center to cut together. 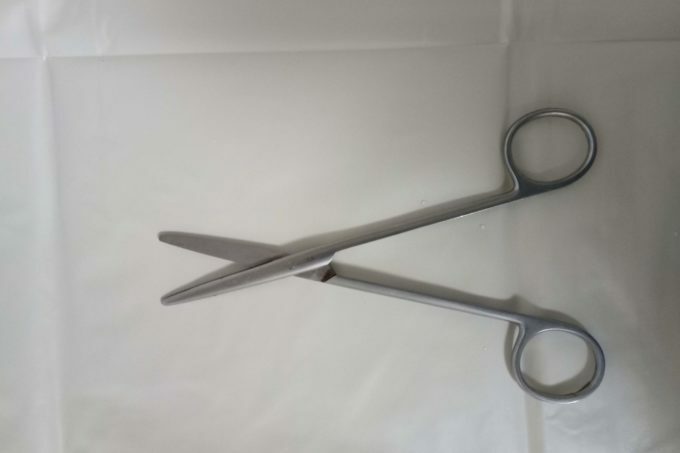 Operating, or surgical scissors, come in different sizes and are used to cut soft tissue. The cutting blades can be straight, curved, blunt or pointed. The function of the operation will determine the shape of the cutting blade. scissors. Iris scissors are small and designed for excising lesions on, or portions of, the iris of the eye. crushing action is an ecraseur. Uses: Used for general cutting of sutures, gauze, and other materials; sharp blades used to cut tougher tissue and frequently used for dissection; blunt blades used for cutting materials such as tubing or gauze. Description: Multi-purpose cutting and dissecting scissors with sharp/blunt, sharp/sharp, or blunt/blunt tip configurations; straight or curved and varying sharpness and lengths. Notes: check for signs of wear and sharpen blades regularly as needed. Uses: Used for general cutting of sutures, gauze, and other materials; sharp blades used to cut tougher tissue and frequently used for dissection; blunt blades used for cutting materials such as sutures, tubing or gauze. Description: Multi-purpose cutting and dissecting scissors, with sharp/blunt, sharp/sharp or blunt/blunt tip configurations; straight or curved and varying sharpness and lengths. Notes: check for signs of wear and sharpen blades as needed. A versatile instrument used in multiple procedures and settings; the straight version primarily used for cutting surface tissue or sutures, but both straight and curved might used interchangeably depending on procedure and physician preference. Description: With a standard beveled blade, Mayos scissors differs straight or curved, and have a variety of lengths, a selection of special features made with blunt tips. Notes: These scissors used for cutting tissue. check for signs of wear and sharpen regularly as needed. These scissors used in multiple procedures, settings and versatile; the curved version commonly used for cutting or dissecting deep or dense tissue, but both straight and curved Mayos used interchangeably depending on the procedure and physician preference. Description: With a standard beveled blade, Mayo scissor straight or Mayo scissor curved, have a variety of lengths, a selection of special features. Its made with blunt or sharp tips. Notes: The screw between the two blades of scissors must securely tighten; check for signs of wear and sharpen regularly as needed. Used to cut suture and supplies. Another name, Suture scissors. Used to cut the suture. Used to cut heavy tissue (fascia, muscle, uterus, breast). Used to cut delicate tissue. Available in regular and long sizes.